Birthdays are special occasions, especially for children. They feel enthusiastic about celebrating their birthday in best possible, and in the most unique way. Decoration items that goes into preparing for a perfect birthday party, is readily available at online stores like Babyoye. The Babyoye online store provide end to end solution for birthday showers, right from birthday hangings to return presents, all are available in just one click. Making a search in these stores is also very easy. These stores also provide various other facilities like free shipping, return option of damaged goods, discount coupons and many more. It is not only about ease that online purchasing avails to its customer, but it is also about the quality and the innovation which can be availed by purchasing online. There is a huge gamut of goods, designed separately for girls and boys, in the online store. Children fantasize a lot about superheroes like Batman, Superman, Spiderman and such, and online store is house of goods based on the themes of such superheroes characters. One can even get attractive return gifts, at huge discounted rates, from online stores. Drawing kits, stationary kits, soft toys and many kinds of gifts are available in the store. 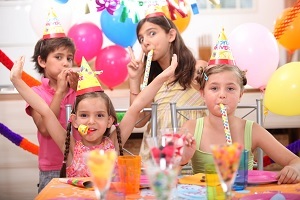 The sites, apart from availing single birthday items, also provide a total birthday package depending upon the choice of the birthday boy/girl. For example, the sites provides package for one year kid’s birthday, wherein all the decoration items and gifts will give a feel of one year kid’s birthday. One of the example of such decoration can be presence of cute little cartoon characters like Shin Chan on all products like balloons, wall hangings etc. They even provide caps for younger ones, who take part in the celebration of their lad. For girls themes of Barbie dolls can be created. Fantastic Innovation! I am pleased with the article as well as the online shopping for birthday decoration items. Taking kids for finding birthday decoration items is like running behind them all day long. This online concept has got everything to my lappy screen. Now i just make them sit & keep browsing such sites & asking them if they want it or not. They even love it as each piece of decoration is from their choice. Prices are quite economy too online. No need for bargain with those hectic shop keepers ever again. Just love the way things have been progressing in ecommerce industry. Shopping online for kids on their birthday is awesome. Its a good way to go because my kids always insists to have things they like on their birthday. Shopping online makes it easy for me to shop with my kids on a screen, handover a computer to them & they shop for their best stuff by making a theme for their birthday. A boon to all mom’s.